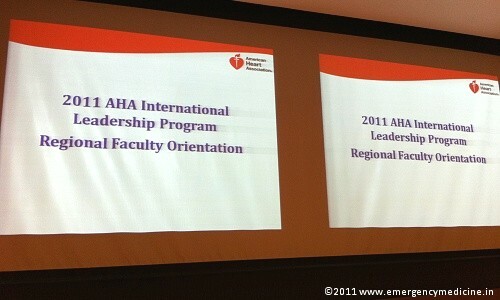 The American Heart Association (AHA) conducted an orientation workshop to certify senior & experienced instructors to take up positions of International Regional Faculty for Asia Pacific region. 12 senior AHA lifesupport instructors underwent the orientation program which was conducted on 13th July 2011, at Max Hospitals, Saket, New Delhi. The AHA trains healthcare providers, caregivers and general public, in responding to emergencies through their Emergency Cardiovascular Care (ECC) training programs. Bobby Wales, an International Training Consultant for ECC Programs, said that Regional Faculty (RF) were not only important for the spread resuscitation education through conduct of Provider, Instructor & Update courses, but also to ensure that the quality of AHA courses conducted by various centers is maintained. This was done by monitoring / auditing the AHA certified training centers & their instructors at regular intervals. Laurence King, Territory Director for ECC International Programs-Asia Pacific, who was also one of the faculty, encouraged the spread of resuscitation training through partnership with Indian institutes. He said that the RF served as a feedback mechanism to report local issues directly to AHA. 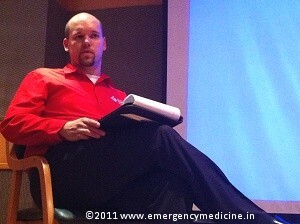 He also strongly encouraged research in resuscitation due to the unique population demographics in India. Top (red shirt) - Bobby Wales, AHA International Training Consultant. 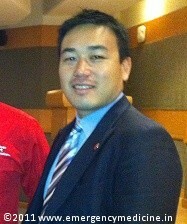 Above - Laurence King, Territory Director for ECC International Programs, Asia Pacific. 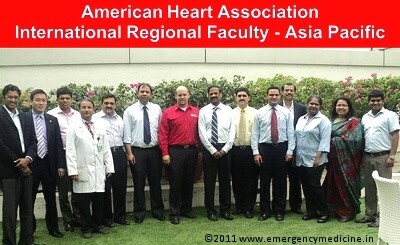 Members of the International Regional Faculty serve as volunteers of the AHA and are responsible for spread of resuscitation science within the allocated region. The AHA provides logistic & financial support for all AHA volunteers. To be eligible to apply for RF, one must be an AHA instructor for atleast 2 years and must have an excellent track record for conduct of AHA courses. The next RF Orientation is scheduled to be in early 2012. L to R - Dr. Imron-Apollo Hyderabad, Laurence King-AHA, Dr. Manoj-Academy of Traumatology Ahmedabad, Dr. Tamorish-Max New Delhi, Dr. Ajay Desai-LIHS Pune, Dr. Joginder-IAEM Delhi, Bobby Wales-AHA, Dr. Raja Rao-EMRI Hyderabad, Dr. Ramakrishnan-TACT Chennai, Dr. Shelke-EMRI Goa, Dr. Pradeep-KEM Hospital Pune, Dr. Vijaya-Apollo Delhi, Dr. Vanita Mittal-Max Delhi, Nataraj Yadav-EMRI Hyderabad. Completing the AHA Provider Course will make you a Provider. Completing the AHA Instructor Course will make you an Instructor. If you are good at coordination with other instructors, you can be appointed as Lead Instructor. If you have conducted at least 8 courses, you can be appointed as Course Director. Your Training Center (TC) Coordinator can appoint you as TC Faculty, if you have been an instructor for atleast 2 years. TC Faculty for RF orientation are selected and invited by AHA, for certification as International Regional Faculty. There are 3 disciplines, Basic Life Support (BLS), Advanced Cardiac Life Support (ACLS) and Pediatric Advanced Life Support (PALS). An ACLS Provider can become ACLS Instructor, proceed to ACLS Lead Instructor and Course Director, to ACLS TC Faculty, and then to ACLS Regional Faculty. Similar line with BLS & PALS.